A new "robot chef" from Moley Robotics is aiming to revolutionize home cooking - but is that a good thing? If you dread the prospect of hitting the kitchen and cooking up a storm for dinner after a long day's work at the office... then you may just be in luck. New technology has been invented with the potential to solve your culinary exhaustion, right in your own home. That is — if you don't mind handing over family recipes and sous chef duties to a "robot chef" built right into your kitchen. 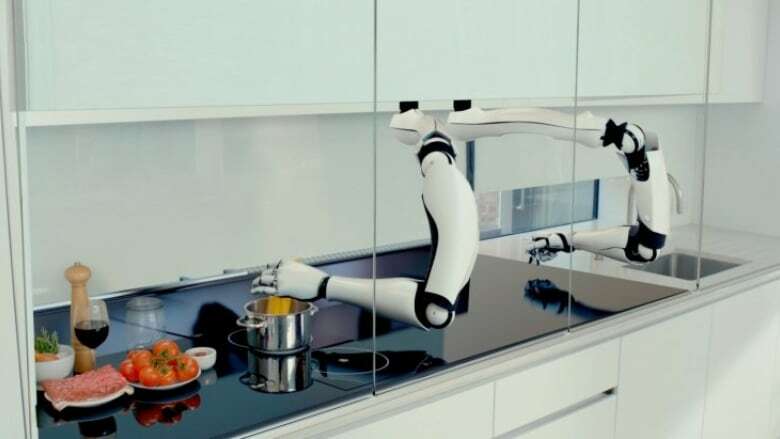 Today as part of our project By Design, we are exploring the future of home cooked meals and asking whether robotics in the kitchen will revolutionize the way we eat... or signal the end of home cooking altogether. The goal of the robot is to help busy people get healthy home-cooked meals — without all the work. It may sound futuristic, but the creators say the "robot chef" should be available by 2017. Moley Robotics' development chef Tim Anderson joined us from London, England to talk about the new technology. While Anderson is optimistic about the robot's potential, another culinary lover is a little more wary. We spoke to cookbook author and food columnist Bonnie Stern, who thinks the robot speaks to our culture's growing disconnect and fear of simple, wholesome home cooking. She was in Toronto. Would you like to have a robot cook you meals? Or does the idea of metal making you a meal leave you cold? Tweet us @TheCurrentCBC using #ByDesignCBC. Post on our Facebook page. Or email us through the website. This segment was produced by The Current's Shannon Higgins and Sujata Berry.